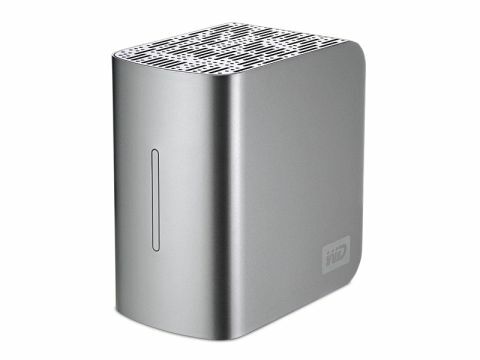 Western Digital My Book Studio II is a preformatted HFS+ (journaled) drive that's available in 1TB and 2TB sizes. It would suit a freelance photographer or music producer needing to access large files locally, or someone less productive who wants to future-proof their storage needs. You can set it up as your Time Machine drive too. It can be configured for RAID 0 or RAID 1 (mirrored) usage. The connections are two FW 800 ports, one USB 2.0 and an eSATA port. Cables come in the box for the different port types except for eSATA, which is not yet a common port type. You can buy an eSATA card and install it on a Mac Pro or later-issue Power Mac G5 Tower. It's hard to offer a single figure that sums up how fast the drive is, because that depends what you use it for. In RAID 0, which offers no data protection, the random uncached write speed was 55.5 MB/sec over FireWire 800 and 27.1 MB/sec over USB 2.0. In RAID 1, which mirrors the drive so that your data is backed up, speed dropped to 38.4 MB/sec overFireWire 800 and 26.87 MB/sec over USB 2.0. Those speeds are competitive but to make sense of these figures yourself download Xbench from www.xbench.com and run it on your Mac to get a rough comparison. Software comes in the box for changing the configuration of the drive. Once loaded a 'WD' icon appears in the header menu. This was easy to access and use. You also get a trial version of a tool for backing up you data, but we found this clunky and much prefer using SuperDuper!, another free download. There were complaints that the first My Book Studio was noisy, but this isn't an issue with this version. On price the My Book is competitive and the per GB cost is great.